Title: 11/09/1990 - Application of the Hazard Communication Standard to hydrotreated refined oils. Thank you for your letter of October 11, regarding the application of the Occupational Safety and Health Administration's (OSHA) Hazard Communication Standard (HCS) to hydrotreated re-refined oils. Mr. J. D. Wilbourn of the International Agency for Research on Cancer stated in his letter of January 24, 1985 to Dr. P.R. Tyson of OSHA, "The conclusions on the refining of base oils are based upon data available to the Working Group and should not be extended to the refining of used oils or any other process that was not considered by the Working Group." Our interpretation of this statement is that there is no evidence that re-refined oil is carcinogenic. Under the HCS, chemical manufacturers have the responsibility to "identify and consider" all available scientific evidence for the chemicals they produce or import to determine if they are hazardous. According to the information you presented above, the IARC Working Group did not study re-refined oils to determine their carcinogenic effects. In general, if an IARC monograph does not address a specific chemical or group of chemicals, the results of the monograph would not apply. This does not necessarily mean, however, as you concluded in your letter, that "there is no evidence that re-refined oils are carcinogenic." It is your duty as the chemical manufacturer to evaluate all other scientific evidence and available studies to determine if any other evidence exists that may indicate a carcinogenic (or other) health hazard is associated with exposure to these types of oils. Stated in another way, the fact that your type of refinery process or type of oil was not addressed in the IARC monograph, does not relieve you of the mandate to look elsewhere for other statistically significant evidence that carcinogenic or other health effects may result from employee exposure to re-refined oils. The re-refined base oils produced using a hydrotreating process at pressures above or below 800 psi and at temperatures below 800 degrees Fahrenheit are exempt from the requirement that the product be designated carcinogenic on the MSDS. Enclosed for your information and review is a copy of OSHA's Federal Register notice of December 20, 1985, which provides the Agency's interpretation regarding lubricating oils and the HCS. The notice summarizes the Agency's position on the issue and may be useful to you as background information to the hazard determination you must perform for the re-refined oils you produce. "Any oil will be considered to be mildly hydrotreated" [and therefore, according to IARC/monograph, no evidence of carcinogenicity exists for such oils] "if the hydrotreatment process was conducted using pressures of 800 pounds per square inch or less, and temperatures of 800 degrees Fahrenheit or less..."
Again, even these findings don't exempt a chemical manufacturer from performing a hazard determination on his product and checking all other sources of information for new evidence which may have been published since 1985 regarding the health effects of exposure to these oils. The HCS requires that MSDSs be updated by the chemical significant information." 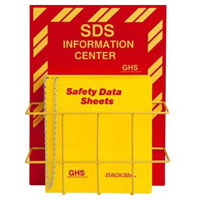 Chemical manufacturers therefore have a positive requirement to stay abreast of hazard information relative to the products they produce and transmit this information with the next shipment of a product after the MSDS has been updated. I hope this discussion and enclosed information is helpful to you. Please feel free to contact us again if we can be of further assistance.